Master Adam to a pessimistic adult student (teacher) at Workshop in the Woods, RPFS. and continues with hands-on audience participation. In a short time, most, if not all, students will be amazed at their newfound ability to juggle three balls in a basic pattern. 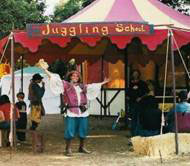 Master Juggler Adam; from schools and renaissance faires to corporate picnics and parties, he has taught thousands of people how to throw up with skill and confidence. The Red Tent; a red and yellow circular tent w/ red scalloped edges that adds lots of color to any event site. The tent has a 14’ capped center pole, 8’ perimeter poles and is approx. 35’ from stake to stake in any direction. Other Teachers; to help with larger classes and individual walk-in pupils. Promotional Opportunities; List lesson times as an entertainment in the event program and list the Juggling School as “free to all” in programs, posters and other promo materials.